HomeAbout The Eye Center of ColoradoDeborah Roos, O.D. 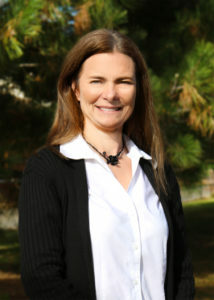 Deborah Roos, O.D. is an Optometrist at The Eye Center. Dr. Deborah Roos received her Doctorate of Optometry from Indiana University School of Optometry in Bloomington, Indiana. She also completed internships at the Perry Point Veterans Administration Hospital in Maryland, the Northfield Eye Clinic in Minnesota, and Pine Ridge Indian Health Service Hospital in South Dakota. She has been serving the eye care needs of patients in Denver for over 15 years. Prior to joining The Eye Center, she practiced at the Swedish Hospital Campus. She also enjoys spending time with her patients and meeting their individual eye health and vision needs. Dr. Roos is available for general eye exams and contact lens fitting for Denver area patients.